Having a great looking Website and a strong presence on social media (Twitter, Facebook, YouTube, etc.) is of course a great marketing strategy for any company, because it allows your message to reach as wide an audience as possible. But what you really need to know to maximize your business is which areas are performing well and which marketing strategies are less effective. If you’re just throwing your money around on various marketing campaigns without actually analyzing them and collecting the necessary data, you are most likely wasting a huge chunk of your marketing budget. The key to business intelligence—that is, understanding what works and doesn’t—is analyzing how your marketing budget is being spent so that you can track both the successes and failures and find the areas that need improvement. At uluad, we believe that transparency is key, which is why we compile comprehensive monthly analytics reports that allow you to see exactly how your money is being spent, giving you a much better, more thorough quantitative breakdown so you can easily determine your return on investment. Not only that, but we take the time to have these monthly analytics reports compiled into an easy-to-read white paper that gives you the clearest overall picture of your ROI. Other online marketing firms will often try to hide their results from their clients and simply insist that their strategies are working; uluad takes a completely different approach. We want our clients to know exactly how their money is being spent and the return they’re getting from our marketing strategies. By analyzing all areas of your marketing strategy, we can use the data collected to align our marketing efforts with your overall business goals. In a nutshell, you will never again have to wonder about whether you’re money is being spent effectively: uluad will give you all the information you need—even if what we’re doing isn’t working. We’re so confident in our skills and our ability to market your company that we don’t feel the need to hide anything from you. After all, we believe that you shouldn’t pay for something that just isn’t working, which is also why we’ll never force you to sign a contract. You can leave us for another marketing firm at any time if you’re not convinced that you’re getting a good enough return on your investment. Probably the single biggest advantage of online marketing is that it allows you to track exactly how your marketing campaigns are performing in real time, giving you a better overall picture of what’s working and what is not. 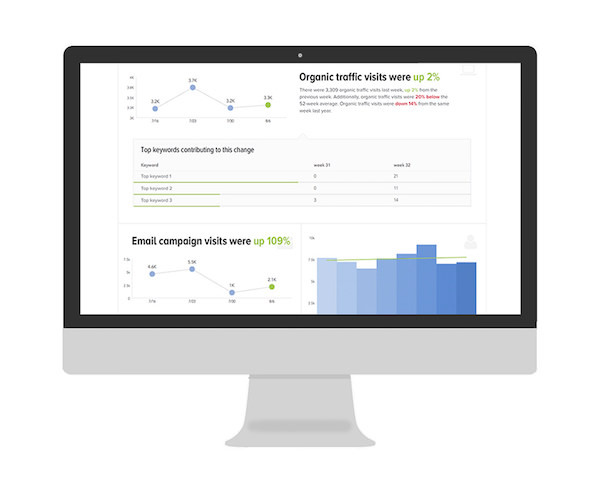 At uluad, we use wide-ranging data analytics that can precisely tell us about the performance of your site and your marketing campaigns. This allows us to focus on what content needs to be improved and also identify potential new marketing opportunities by monitoring the latest web trends. Not only do we take web rankings into account, and of course try to get your Website to rank as highly as possible, but we also take advantage of predictive analytics that will allow your business to stay ahead of the curve, instead of simply trying to play catch up. We believe that the key to any effective online marketing strategy is knowing what the future trends might be and capturing that market before your competitors do. If used properly, social media can be one of the most powerful online marketing tools available. That’s why we also take the time to perform analytics of all of your social media sites, whether it be Twitter, Facebook, Pinterest or whatever else. Paying for advertising on all of these sites can be incredibly lucrative, but it can also be a huge waste of money if you don’t know what you’re doing. It’s important to choose a marketing firm like uluad that will spend the necessary time and energy to fully analyze your social media accounts as well. By doing so, we can again pinpoint the areas that are most effective, allowing us to focus more on what actually works, instead of simply taking a shot in the dark and trying things at random. A full social media analysis is included in your easy-to-read monthly analytics report, so you can be sure that we’re spending your marketing budget on things that really work. Online marketing can sometimes be something of a guessing game. At uluad, our monthly analytics reporting will always show you exactly how your money is being spent. Clear, honest communication and transparency is paramount to any successful business relationship, and it’s our commitment to you.